PETALING JAYA, 18 November 2014 – Two former board members of the National University of Malaysia (UKM) described their service as a sacrifice for the younger generation and not something to enrich themselves. Thanking UKM for appreciating their services, Dato’ Dr Azmi Abdullah and Dato’ Dr Amran Kasimin said that that the welfare of the students is their primary responsibility. Speaking at an appreciation ceremony in conjunction with the conclusion of theirs and Dato’ Dr Megat Abdul Rahman Megat Ahmad’s services here today, Dr Azmi and Dr Amran said they were committed to upholding the trust that UKM gave them. Chairman of the UKM Board Emeritus Professor Dato’ Dr Mohamad Zawawi Ismail, Vice Chancellor Prof Dato’ Dr Noor Azlan Ghazali and the Deputy Vice-Chancellors were present. Dr Megat Abdul Rahman, who was UKM’s first treasurer, could not be present at the event as he was in Kelantan for duties in Kelantan. Dr Azmi said he, like Dr Megat Abdul Rahman, is very sensitive about the news in the press that could jeopardise the good name of UKM in particular and the country’s higher education in general. Dr Azmi, who has an economics background, expressed concern over the speech of a minister recently about new graduates. “I felt slighted when one of our leaders stated that the problem was no longer about unemployed graduates but of unemployable graduates,” he said. It made out as if universities were not giving enough preparation to the graduates saying that everything possible had been done to provide students with the knowledge they needed to face challenges after graduation. He, however, admitted that UKM needed to adapt with the changing times and situations in a globalised economy that is becoming increasingly critical. Dr Azmi served as a member of the board of directors from 1998 to 2014 and before that as a council member from 1990 to 1998. He began his career as a lecturer in the Department of Administration, Faculty of Economics and Management of UKM in 1975, but switched to the private sector when he received offers from a commercial bank. Dr Amran, who was trained as an Islamic scholar, viewed impartiality as important when serving as a member of the board of directors. “We must be sincere and not show favouritism. We must not be biased against people simply because we do not like them,” he said. Dr Amran was among the inaugural batch of UKM graduates from the Faculty of Islamic Studies in 1974 and subsequently went on to pursue his Master’s degree and PhD in the United Kingdom. He said sincerity was important although it does not guarantee promotion. Eventually, sincerity will be appreciated when people see our true intentions compared to those who heap praise solely to ingratiate the boss. Dr Amran was a teacher of a religious school in Johor in 1966 and tutor at the Institute of Malay Languages, Literature and Culture of UKM in 1974. He was appointed as a lecturer in the Department of Malay Literature in 2000. He was a member of the board of directors from 2005 to 2014. Dr Megat Abdul Rahman, who has a profesional Accountancy degree from Australia and a Certified Public Accountant, started his career as an auditor at Coopers and Lybrand in Sydney, Australia for three years. He returned to be appointed as head – and later Dean of the School of Accountancy at Mara Institute of Technology (now UiTM) until 1970. 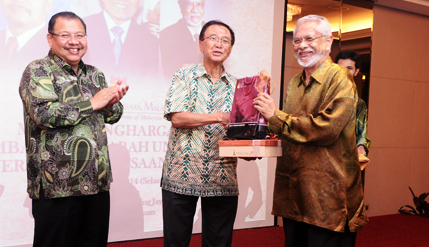 He was appointed UKM’s first Bursar from 1970 until 1973 and in 1998 became a board member until this year.